Getting A New Mac? Delete Your Data From Your Old One! But since we’re replacing our computers at a faster clip, this means we’re also getting rid of computers more often as well. For some, this means giving the old one to the kids or another family member or maybe keeping it around as a backup. In this instance, it’s not always necessary to reformat the hard drive to delete your data; but if the computer is going anywhere outside of your house, it means you have to be cognizant about what happens to the personal information on your old computer. Short of physically removing your hard drive (a difficult task in most models), the best way to “zero out” the data is to reinitialize the hard drive using the original installation media. OS X.7 and earlier Macs: Boot while holding down the “C” key. OS X.8 and later Macs: Boot while holding the Command-R keys. In both instances, you’ll be given the opportunity to reinstall the operating system. You’ll want to launch DISK UTILITY from the “Utilities” menu and erase the hard drive before proceeding. Confirm that you have copied all the data off your old Mac before erasing the hard drive. 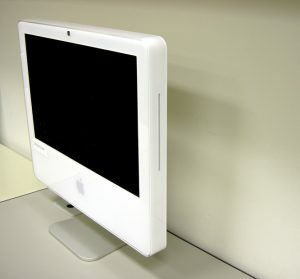 If you’re selling/donating/giving away your old Mac, include the original OS media if possible. If you need help preparing your old Mac for donation or sale on eBay or CraigsList and aren’t sure how to expunge your data, call your computer professional before giving it away! If you’re really paranoid about some super hacker with advanced data recovery skills gleaning your information off of your formatted hard drive, then physically remove the drive from the computer before parting with it. Yes, there’s a little more to this than I have space for here. The bottom line – don’t allow a computer containing your personal data to be out of your control. We’re all extremely aware of the consequences of identity theft.